Lightweight flexible and comfortable foam chassis design. Injected molded plastic shoulder pads. 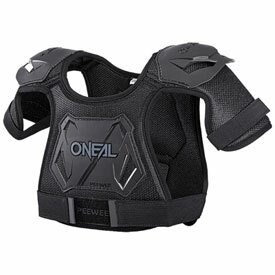 TPR Chest and Back protection for supreme protection. S/M – fits ages 2-5 yrs. Approximately 35-40in tall, 28-40lbs. L/XL – fits ages 5-7 yrs. Approximately 40-50in tall, 38-55lbs. 100% satisfied and take comfort in knowing my son is protected!